The last few days in Glasgow have been unbelievably sunny and warm - nary a cloud in the sky. Very un-Scottish. With the reemergence of the sun and warm weather, Glaswegians have suddenly begun to populate the parks in their shorts and pasty white skin, blinding those without the protection of sun glasses with their puckered white flesh. Often resembling the creamy white underbelly of a fish. Such behaviour is also characteristically Canadian. With the first snow melt of the spring, Canadians often break out the shorts and ceremoniously celebrate with beer and a plethora of children can be seen playing road hockey. Always with the changing seasons, i become homesick: when winter rolls around, i miss the snow, Christmas lights, and low-fat soy eggnog; with the first sunny weekend of Spring, i miss the play offs (hockey, as it were) and the annual event of disappointment because the Leafs fail me yet again. Summer, well, i mostly hated it in Toronto because of the smothering humidity and pollution. Running outside was an exercise in breathing and i hated having to be so dependant on my asthma inhaler. With fall, there really is no experience like it in Canada. Although you do get fall (or "autumn", rather) in Scotland, it's just not the same. And although Glasgow cannot even compare to Toronto with the changing seasons, Toronto ain't got nothin' on Glasgow when it comes to the rows and rows of Easter chocolate at all the grocery stores this time of year. Praise Jebus! Uk is a country of chocoholics!! Glad you're enjoying the rare scottish sun!! 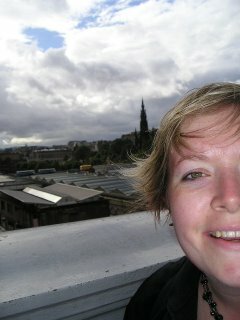 I think this summer I'll be VERY homesick for the cool of s cottish summer in Glasgow!! Those chocolates that you gave us at Christmas were gone in 2 days!!! Between me and Jake u cannot keep that stuff in the house! !